do not realize that they are in it. in it (not realizing they are in it). all of the right answers? 🙂 The flames are everywhere and global warming is rapidly intensifying. Although… I guess parts of it do still freeze over. Oh, the extremities we endure! Does that ant know he’s in hell? Interesting post and pic! The ant is entering the bowels of Hell! In The Brothers Karamazov, Dostoevsky said, “What is hell? I maintain that it is the suffering of being unable to love.” There are too many today who don’t love others, the world, or themselves. Yes… and far too many who do not do a thing to help the environment. Intense photo! Love the rich color. As first the insects disappear and then out the food web, we will learn what “hell on earth” means. It’s just a matter of time. Too many selfish people want to hold on to their fancy, big vehicles and go on fossil fuel plane vacations. 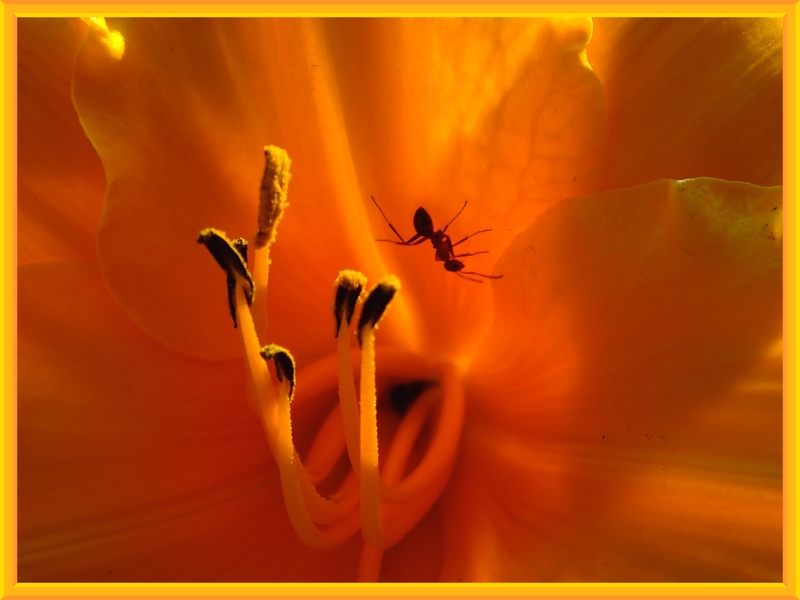 I don’t know which looks more delicate – the Stella Daylily or the ant … and the lighting is fantastic! That’s the sun, on the west side of the flower and river, that is helping so splendidly with the lighting. 🙂 At least the ants will still be around — and many species of them — far after humankind is gone. they couldn’t find the nest, but Pest Masters honed in on it and put marigold dust into the nest … dead carpenter ants started dropping out and it is a dropped ceiling and we slid the panels back – more dead ants. This was too bad since Ortho recommended us to chop down two big oak trees and a locust tree, remove all the bark in the gardens and replace it with cedar mulch … they found and destroyed the nest in a matter of minutes! I wonder if there were ants in prehistoric times – you would likely know that answer Tom. Contrary to popular belief, hell is not talked about in the Bible. I think this link will of interest to you.